The subspecies coronata and auduboni were at one time considered separate species, Myrtle and Audubon’s Warblers respectively, but since 1983 have been treated as conspecifics due to the presence of hybrid zones from northwest British Columbia to southwest Alberta (Barrowclough 1980, AOU 1983). Curson et al (1994) suggested, however, that a more appropriate treatment is to consider the two taxa as two of four allospecies within the superspecies [S.] coronata, the others nigrifrons (Black-fronted Warbler) of the southwest United States and goldmani (Goldman’s Warbler) of southern Mexico. Analysis of a narrow hybrid zone in Alberta supports this treatment; although genetic distance between coronata and auduboni is slight, the hybrid zone has remained narrow and stable, suggesting assortative mating (Hunt and Flaspohler 1998). Genetic evidence suggests that, rather than Myrtle and Audubon’s arising as a result of allopatric isolation, Audubon’s is a rare avian example of a taxon of hybrid origin. Its genome contains alleles derived from both presumed parental taxa, migratory Myrtle and non-migratory Black-fronted (Brelsford et al 2011); isotope studies show that Audubon’s possesses Myrtle rather than Black-fronted genes at an allele associated with migration (Toews et al 2014), resulting in the migratory capability of Audubon’s Warbler. In this account, Myrtle and Audubon’s Warblers will be treated separately. Status: Common regular spring and fall migrant statewide. Rare regular winter visitor from North Platte and Platte River Valley counties south. Documentation: Specimen: UNSM ZM6857, 20 Apr 1901 Havelock, Lancaster Co.
Taxonomy: The westernmost populations of Myrtle Warbler have been considered separable as hooveri (Curson et al 1994; Dunn and Garrett 1997); this taxon has been described as breeding from Alaska south to British Columbia and wintering from Colorado, Kansas, and Missouri southward (AOU 1957). Pyle (1997), however, considered differences between coronata and hooveri only clinal and insufficient to warrant subspecific status. Rapp et al (1958) stated that hooveri occurred in Nebraska, presumably as a migrant. Intergrades between Audubon’s and Myrtle Warbler are not uncommon. An often-reported form resembles Audubon’s Warbler, but the yellow throat is outlined in white. A male collected 20 Apr 1920, UNSM ZM6849, in Lancaster Co has yellowish feathering on a white throat and limited whitish wing bars. One at Lake Ogallala, Keith Co 15 Feb 2015 had the facial and throat pattern of Audubon’s Warbler, but its calls resembled those of Myrtle Warbler. One reported from Lancaster Co 24 Jan 2016 was judged to be a hybrid, as was one in Keith Co 11 Nov 2017. Changes since 2000: Numbers occurring during winter have increased during the past decade based on CBC data (Figure 1). Numbers in Feb in the south especially have increased dramatically beginning in the winter of 2007-2008; prior to that winter there had been only 11 records in all for Feb, but numbers began to increase until the unprecedented count of 16 in Feb 2014-2015. Figure 1. 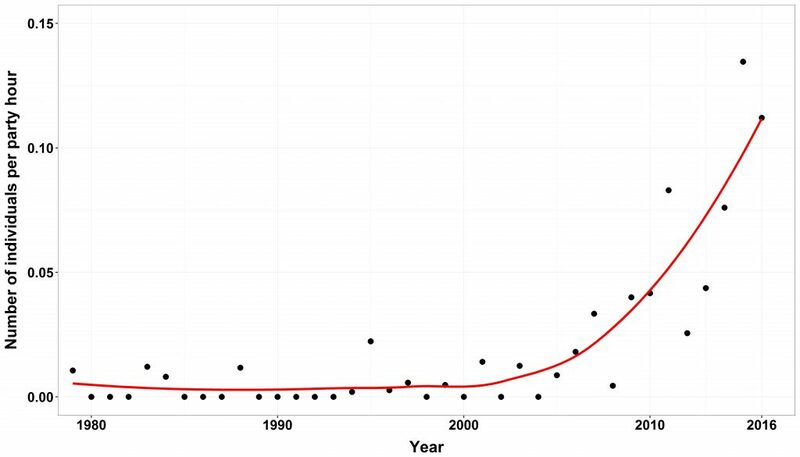 Number of Yellow-rumped Warblers recorded per party hour during Christmas Bird Counts in Nebraska during the period 1980 to 2016. Points represent reported values and trend line created using locally weighted scatterplot (LOESS) smoothing. Data collected by volunteers and provided by National Audubon Society and the Nebraska Ornithologists Union. Migrants are discernible during Mar from counties along the Platte River Valley southward, expanding northward and becoming numerous by mid-Apr; peak counts occur in early to mid-May. In the north and west, early dates are in mid-Mar; reports in Jun cited above are away from known breeding areas. Sightings in early Mar or earlier are probably of birds that wintered nearby (see Winter). There are a few reports Jun-Aug without information on subspecies of these sightings; these are included in Audubon’s Warbler. High counts: 755 in Sarpy Co 11 May 1996, 260 at North Platte NWR, Scotts Bluff Co 3 May 1995, 255 in Lancaster Co 10 May 1996, and 120-150 in Burt Co 29 Apr. An earlier date was of one at Fontenelle Forest, Sarpy Co 21 Aug 2014. Migrants become noticeable in mid-Sep and peak migration is in early Oct. Numbers and distribution thereafter begin to decline, with the western Sandhills and northern Panhandle vacated in Nov, and the Panhandle and area north of the Platte River Valley counties in Dec.
Northerly and northwesterly reports in Nov-Dec are few: 8 Nov 2018 Knox Co, 6 Dec 1988 Boone Co (Cortelyou 1989), two on 29 Dec 2001 Calamus-Loup CBC, and eight on 30 Dec 1995 Calamus-Loup CBC. Later reports (Jan-Feb) are discussed under Winter. High counts: 129 in Washington-Douglas Cos 13 Oct 1996, 120 in Nance Co 8 Oct 2006, and 120 at Branched Oak Lake SRA, Lancaster Co 6 Oct 2018. Winter: As noted under Fall (above), by Dec most birds are found in the south. This distribution persists through Feb, but with much reduced numbers that vary markedly from year to year. Prior to winter 2006-2007, there had been only 11 reports for the state in Feb, but beginning in 2007, Feb reports have increased markedly, with nine in the winters 2006-2007 through 2013-2014, followed by an unprecedented 16 reports 2014-2015. There was a similar influx in winter 2015-2016; reports that winter brought the all-time total number of Feb reports to 41, 21 of these in the 2014-2015 and 2015-2016 winters. Reports are fewest in Jan-Feb, especially north of counties along the North Platte and Platte River Valleys. These are: 2 Jan 1971 Dawes Co (Cortelyou 1971), 1-2 on 10-11 Jan 2006 Keya Paha Co, 10 on 14 Jan 2017 Brown Co, 20 Jan 2011 Burwell, Garfield Co, 29 Jan 2001 Niobrara SP, Knox Co, 5 Jan-3 Mar 2002 Niobrara SP, 19 Jan-23 Feb 2014 Antelope Co, 30 Jan 2010 Custer Co, two on 7 Feb 2011 Dakota Co, five on 14 Feb 2015 Custer Co, 16 Feb 2011 Wheeler Co, 19 Feb 2008 Hutton Sanctuary, Rock Co, 22 Feb 2017 Thomas Co, 26 Feb 2011 Wheeler Co, 27 Feb 1999 Wolf Lake, Rock Co, and 27 Feb 2004 Cherry Co. Status: Fairly common regular spring and fall migrant west, uncommon central, rare casual east. Uncommon regular breeder northwest. Rare casual winter visitor west-central. Documentation: Specimen: UNSM ZM6847, 21 May 1900 Sioux Co.
Taxonomy: See comments under Myrtle Warbler. Birds breeding in Nebraska were assigned to subspecies memorabilis by AOU (1957); this poorly-differentiated eastern race is now considered synonymous with auduboni within the Audubon’s Warbler group (Pyle 1997). Earlier reports are from the same location near North Platte, Lincoln Co, and may have been wintering birds (see Winter): two males on 1 Mar 2012, 18-25 Mar 2013, and 8 Apr 2016. A later sighting was of one in western Cherry Co 10 Jun 2010. Extreme dates for migrants at Barr Lake, Colorado are 7 Apr and 6 Jun (Andrews et al 2002). There are few reports for the east, although four occurred in 2013 alone; records are 24 Apr 2013 Knox Co, 25 Apr 2009 Howard Co, 25 Apr 2013 Lancaster Co, 26 Apr 1999 Fontenelle Forest, Sarpy Co, one photographed 27 Apr 2015 Omaha, 1 May 2016 Buffalo Co, 2 May 2002 Schuyler, Colfax Co, 3 May 2017 Dodge Co, 5 May 1970 Lancaster Co, 6-7 May 1967 Lancaster Co, 6 May 2013 Lancaster Co, 12 May 1959 Burt Co, and 12 May 2013 Jefferson Co. In the eastern Rainwater Basin there are three reports 15 Apr-13 May (Jorgensen 2012), and, in Lincoln Co, Tout (1947) cited occurrence 23 Apr-10 May. At NNF Bessey, Thomas Co, it occurs regularly in spring and fall (Bray 1994). We believe Ludlow’s (1935) description of this taxon as a “common migrant” in Webster County with reports 18 Apr-21 May unsubstantiated that far east. High counts: 13 at Oliver Reservoir, Kimball Co 17 May 1999, 12 at Kimball, Kimball Co 31 May 2011, and 9 at Bushnell Cemetery, Kimball Co 28 May 2011. Summer: Audubon’s Warbler breeds in open ponderosa pine woods, with a preference for areas near deciduous trees (Johnsgard 1979), on the Pine Ridge in Sioux, Dawes, and Sheridan Cos. During the first breeding bird atlas for the period 1984-1989 (Mollhoff 2001a), reports were from Sioux and Dawes Cos, but breeding was first confirmed in Sheridan Co during the second atlas period 2006-2011 (Mollhoff 2016). It was present in summer in Sheridan Co in 1992 and 1993. Reports of breeding apart from the BBAs include one of a pair along Pants Butte Road, Sioux Co carrying food 6 Jul 2002, and a nest with half-grown young was found 12 Jun 1999 in West Ash Canyon, Dawes Co (Mollhoff 2001b). Both the first and second BBAs showed a total of six reports in the Wildcat Hills of Scotts Bluff, Banner, and Morrill Cos, (Mollhoff 2001a, 2016), although nesting there has not been confirmed. There are summer reports, apart from those in the BBAs, in Scotts Bluff Co 16 Jun and 7 Jul 2001, 20 Jun 2017, 30 Jun 1974, 30 Jul 1994, 4 Jul 1992, 4 Jul 2005, 4 Jul 2017, and 29 Jul 2017, and in the Banner Co section 7 Jul 2001. There are a few reports Jun-Aug away from the breeding range, presumably of this taxon, but without details: 27 Jun 2008 Seward Co, 30 Jun 1967 Platte Co, 30 Jun 1967 Greeley Co, 1-24 Jul 1976 Custer Co, 9 Jul 1989 Hall Co, 10 Jul-1 Aug 1989 Lincoln Co, 12 Jul 1981 Douglas-Sarpy Cos, 13 Jul 1981 Garden Co, 13 July 1983 Lincoln Co, 16 Jul 1993 Lincoln Co, 17 Jul 2012 NNF Bessey, Thomas Co, and 11 Aug 1974 Lincoln Co. There are later reports of one in the Panhandle 26 Oct, two at a feeder near Mitchell, Scotts Bluff Co 31 Oct 2004, and one in Wayne Co 3 Nov 2014. The latest specimen date for Audubon’s Warbler is 27 Sep 1920 Sioux Co (UNSM ZM6844). Individuals appear in the Panhandle away from breeding areas in late Aug; the early dates above are away from the breeding range. Tout (1947) cited occurrence 24 Sep-Oct 9 in Lincoln Co. Extreme dates at Barr Lake, Colorado, are 6 Sep and 23 Nov (Andrews et al 2002). Rosche (1994) stated that Audubon’s is “much scarcer” than Myrtle in the Keith Co area in fall and departs earlier than Myrtle. The only reports from the east are of singles in Omaha 21 Aug 2011, two on 11 Oct 1934 Webster Co (Ludlow 1935), and 3 Nov 2014 Wayne Co.
High counts: 32 at Oliver Reservoir, Kimball Co 20 Sep 2003, and 13 at Bushnell Cemetery, Kimball 22 Sep 2018. Winter: There are three records from the Lake McConaughy area, Keith Co. One was photographed at Lake Ogallala 23 Feb 2013, one was found on the Lake McConaughy CBC 28 Dec 2013, and another was there for the 2 Jan 2016 CBC. One was at Branched Oak Lake, Lancaster Co 12 Dec 2015. Two reports in Lincoln Co in Mar (see Spring) suggest that wintering may occur in the cedar canyons there. One was reported without details on the Scottsbluff CBC 15 Dec 1979. Barrowclough, G.F. 1980. Genetic and phenotypic differentiation in a Wood Warbler (Genus Dendroica) hybrid zone. Auk 97 :655-668. Brelsford, A., B. Mila, and D.E. Irwin. 2011. Hybrid origin of Audubon’s Warbler. Molecular Ecology 20: 2380–2389. Cortelyou, R.G. 1971. 1970 Christmas Count. NBR 39: 4-9. Cortelyou, R.G. 1989. 1988 Christmas Count. NBR 57: 3-9. Hunt, P.D., and D J. Flaspohler (1998). Yellow-rumped Warbler (Setophaga coronata), version 2.0. In The Birds of North America (A. F. Poole and F. B. Gill, Editors). Cornell Lab of Ornithology, Ithaca, New York, USA. https://doi.org/10.2173/bna.376. Toews, D.P.L., A. Brelsford, and D.E. Irwin. 2014. Isotopic variation across the Audubon’s–myrtle warbler hybrid zone. Journal of Evolutionary Biology 27: 1179–1191.